Reheating pizza is an important skill, especially since we're talking Italy all week long! So we're re-running this post. Thank us later. So you've managed—by some divine grace—not to finish your entire pizza. That alone is accomplishment enough, and you should be proud of your noble restraint. You know what they say: Good things come to those that wait. See, there have been studies that prove it. The good thing coming to you? The ultimate leftover pizza lunch. What has not been studied enough, however, is the best way to reheat these glorious leftovers. The microwave, technical marvel that it is, will render your slice a soggy mess, with a crust that's way too hot and mushy. (Really, if you're going to burn your mouth on anything, it should be the cheese.) The oven, while it restores that crispness that made you fall in love at first bite, will also dry out your cheese and toppings. No amount of crunchy base is going to make up for that failure. We polled several experts, and the recommendation was near-unanimous: Use a skillet. Anthony Falco, Roberta's head pizza maestro, recommends putting your slice in a non-stick skillet on medium-low for a couple minutes. Once the bottom is crisp, add a couple drops of water to the pan, turn the heat to low, and cover with a lid. In about a minute, you'll have fluffy crust and melted cheese. He even shared a super-helpful illustration that he drew himself—a true Renaissance man! 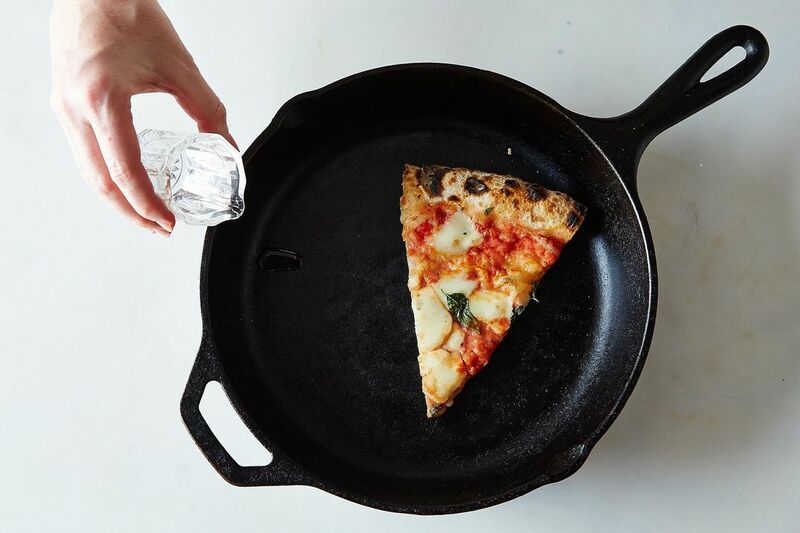 Mark Bello, the founder and head pizza instructor at Pizza a Casa Pizza School, likes to tamp down a piece of foil over the pizza, to create a "moisture-crispness canopy." The bonus with this technique? Lifting up the foil for the big reveal gives off a blast of delicious warm pizza smell. Our resident pizza expert, Ryan Hamiton, goes rogue: He reheats his pizza in the toaster oven. Here's how he does it: "I pop two slices in at 350° F for maybe 5 minutes, and then I usually eat a third cold slice while I wait on its friends." After all, leftovers are all about easy eating. 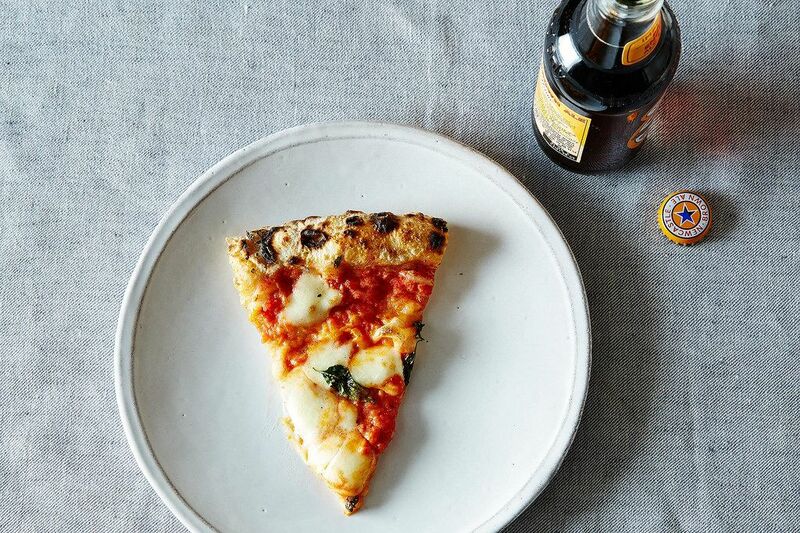 Now, they're also about perfect pizza—no preheat necessary. 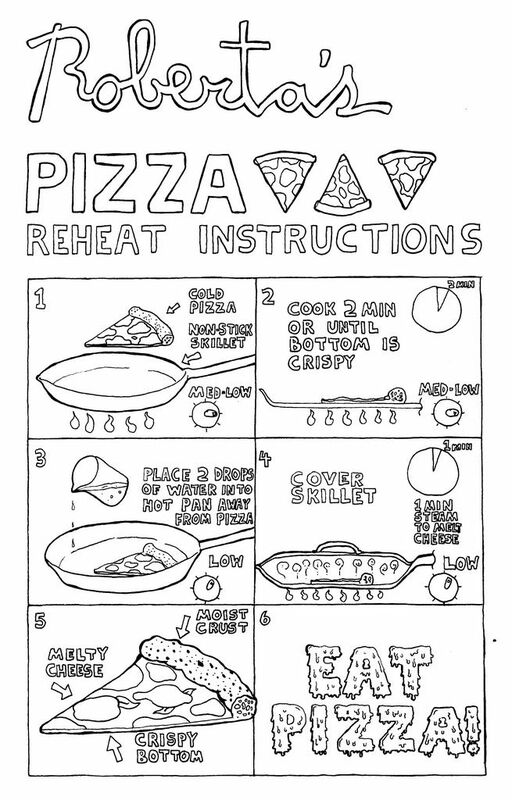 How do you reheat your pizza? Or do you just eat your leftovers cold? Tell us in the comments! Photos by James Ransom. Illustration by Anthony Falco. This post was originally published in September 2014, but we liked it—and reheated pizza—so much, we had to share it again. I've tried it this way several times and it just doesn't work the way described. I've even adjusted the directions, and still it does not work the way described. This worked well for regular or thin crust. The thick crust was hot on the bottom but still cold on top. Since I had a combination of thin and pan or real thick crust in the same pan, I had to remove the thin crust and place the thick crust in the microwave grill setting. The thick crust was going to burn the bottom in the pan with still have a cold topping. I guess I’m still quite a novice. A frozen slice in a screaming hot oven for 5 mins or so. Perfect !! Mostly I eat it cold. Skillet method is second choice. 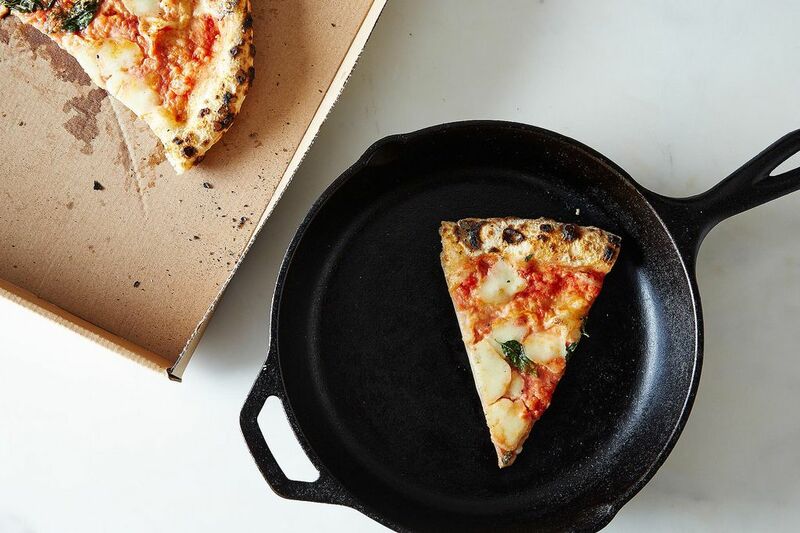 Would be useful if you said whether to put the pizza on the skillet cold, or to pre-heat it first. Always in a skillet on the stovetop. I have never added water, though, and will definitely test it out! Thanks for the ideas. I use a cast skillet in the oven at 350, the pizza comes out crispy and yummy! Perfect way for my family - place slices in toaster oven on rack and heat on dark toast setting. The slices come out bubbly on top and the crust is perfectly crisp. Seven minutes on a perforated pan starting in a cold oven. I've never had any problem with toppings drying out. I am not myself Italian, and I do not like soft pizza crust. First I heat up some olive oil in any old pan, drop in the cold pizza and wait for the magic to begin. No water necessary, drop a cover on it for a smidge. Decadent! Broiled pizza slice in the toaster oven for five minutes at about 300 or so. Crispy, melty and hot. I've never had a dried out piece of pizza that way--somebody must be doing something wrong. Put room temp pizza on a cookie sheet. Put it in a Preheated 350 oven for exactly six minutes. I microwave the slice for 20-30 seconds, so that they get warm and the cheese a little soft. Then I put it in a preheated cast iron skillet to finish it off for 2-4 minutes. DELICIOUS!